The world’s best surfers battled dangerous conditions at Teahupo’o as competition ran through Rounds 3 and 4 of the Billabong Pro Tahiti, stop No. 7 on the 2015 Samsung Galaxy World Surf League (WSL) Championship Tour (CT). Four surfers earned a direct advance to the Quarterfinals and the stage is set for a thrilling Finals Day tomorrow, beginning with Round 5. Round 4 started with a bang, as Filipe Toledo (BRA), Kai Otton (AUS) and Owen Wright (AUS) fought for a place in the Quarterfinals. The trio quickly got to work and kept busy, but it was Wright that locked in the only excellent score of the heat, an 8.17, to take the win. Wright winning in Round 4 with a heat total of 14.84 points. Wildcard Bruno Santos (BRA) posted an excellent nine-point ride to open Round 4 Heat 2 and put the pressure on reigning WSL Champion and defending event winner Gabriel Medina (BRA). Medina answered by finding one of the biggest barrels of the day and a near-perfect 9.97, backing it up with a 7.67 for a place in the Quarterfinals. Rookie Italo Ferreira (BRA) was left trailing behind his more experienced competitors and will surf again in Round 5 alongside Santos. Medina winning in Round 4 with a heat total of 17.64 points which included a near perfect 9.97 point ride. Josh Kerr (AUS) claimed his second victory of the day in Round 4 Heat 3 and earned a place in the Quarterfinals. Kerr battled injury wildcard Aritz Aranburu (ESP) and rookie Wiggolly Dantas (BRA) in the day’s penultimate match-up after eliminating 2013 event winner Adrian Buchan (AUS) in Round 3. Kerr winning in Round 4 with a heat total of 13.20 points to advance in to the Quarter Finals. The final heat of the day saw 11-time WSL Champion and four-time event winner Kelly Slater (USA) take on Jeremy Flores (FRA) and C.J. Hobgood (USA). After a slow start Flores was first to earn a score of significance with a 7.83. Slater answered with a 6.83 to take the lead but Flores quickly came back. Last-minute heroics from Slater netted him an excellent 9.77 and a pass to the Quarterfinals. Slater winning in Round 4 with a heat total of 16.60 points which included a near perfect 9.77 point ride to advance in to the Quarter Finals. 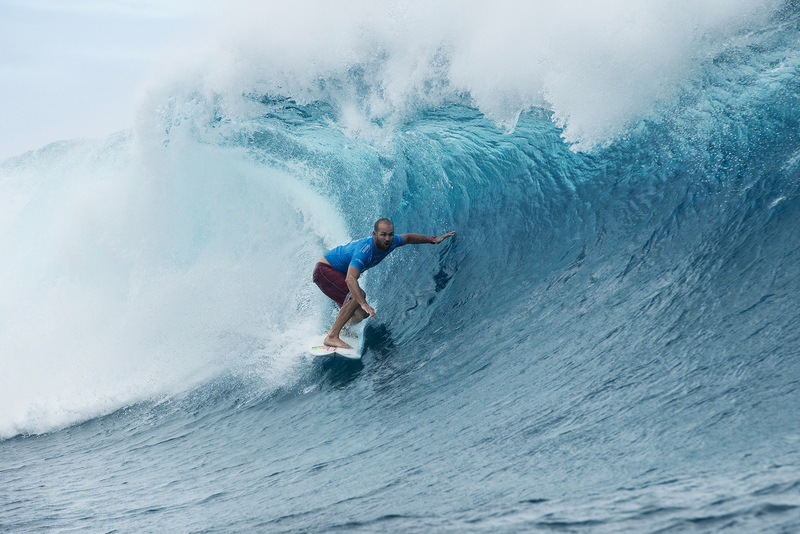 Hobgood, who will surf again in Round 5, claimed the first Perfect 10 of the competition in Round 3 to upset current no. 3 on the Jeep Leaderboard Julian Wilson (AUS). The 2004 event winner found his way out of an impossible barrel after the foam ball to send Wilson home in equal 13th place. Hobbled posting a Perfect 10 point ride during Round 3 advancing in first place into round 4 . Flores will join Hobgood in elimination Round 5 and previously dispatched Joel Parkinson (AUS) in Round 3 with the highest heat total of the day, an 18.87, for his show of commitment and technical barrel riding. Parkinson wipesout during Round 3 where he was defeated and eliminated from this year’s event. 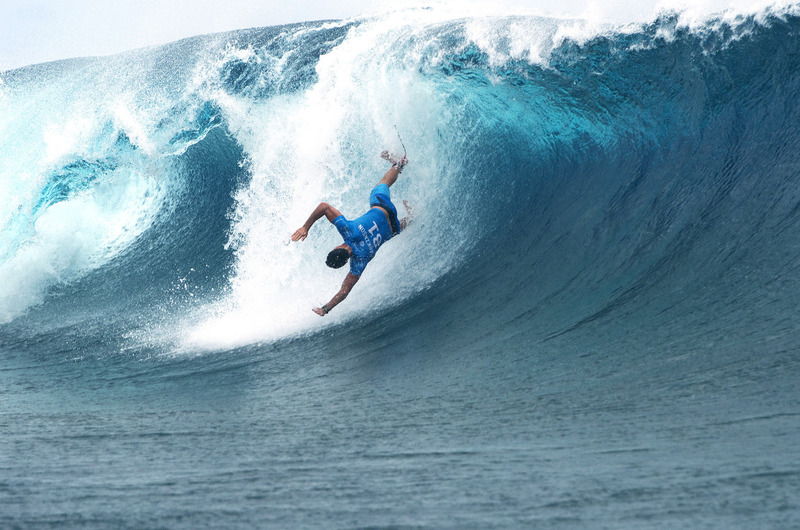 Reigning WSL World Champion and defending event winner Gabriel Medina soars through the air after completing a perfect 10 point ride during Round 4. First to compete tomorrow will be Filipe Toledo (BRA) and Italo Ferreira (BRA) in Heat 1 of Round 5. Event organizers will reconvene at 7 a.m. tomorrow to assess conditions and make a call for competition. The Billabong Pro Tahiti runs from Friday, August 14 to Tuesday, August 25, 2015 and is webcast LIVE at WorldSurfLeauge.com and via the WSL mobile app.